Our trip started really well with Paulette driving me to the airport, and me feeling confident that I’ve never been so well organised. That lasted until I was walking into the airport, I was thinking that I’d text my son Mark who was flying from Auckland and meeting me in Singapore, and I realised that my phone was still charging on the table at home. Having told all of you that I’d be blogging I decided to get a new phone in Singapore. So if anyone wants a cheap HTC Desire 616 with dual SIM capacity when I get home just contact me. The first flight went pretty well with one book read and a short sleep. After an hour or so I met Mark as he came off the plane and following a bit of a wander around the shops we found a quiet spot and chatted for a few hours until our flight to Paris was ready. We both slept a few hours and arrived feeling not too bad. 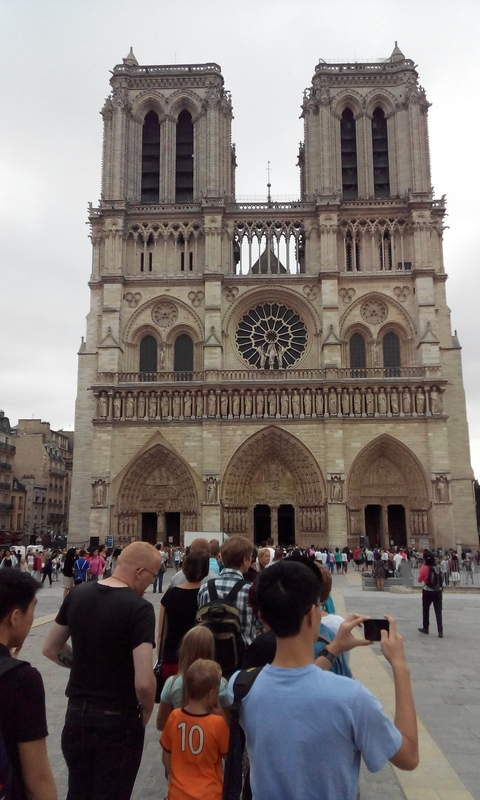 After dropping our bags at our hotel we decided to head for Notre Dame cathedral which was heaving with tourists but as lovely as ever. We found a quiet spot to sit and enjoy the interior and a choir singing some (probably) contemporary chants. A few hundred metres away we got to the Pompidou centre to look at the 20th century art to find it closed on Tuesday. So much for our excellent planning. A Croque monsieur and and a good beer we checked into our hotel and have just had a shower and a lie down. Might go out again shortly. My leg stood up reasonably well but I was a bit sore by the end. Hi Quilliam, how long will you be staying in France and which cities will you be visiting ? Hope your knee won’t be giving you too much trouble during your holiday. Hi Quilliam, Good to hear that you have arrived in France. Trust you and Mark are having a great time exploring Paris, and that your knee is o.k. Get that sketch pad working! Hi Quilliam and Mark, (2nd try!) hope you both are enjoying Paris, and then Bordeaux. How is your French ? Trust the knee is holding up, and the sketch book or camera is working well. Sounds as if the knee is going to cause a few problems but keep up with the pills and ointment. Hi Quilliam & Mark, great to hear that you are using trains for getting around- although later with car you will be able to stop and go where you please. Keep enjoying your time away. Hi Quill, glad to hear that the trip is going well. Enjoying your blogs. Weather bitterly cold here at present so enjoy the warmth over there.! Keep up the pills and potions for your knee and look forward to reading your next instalment.